A new world of flexible, bendable, even stretchable electronics is emerging from research labs to address a wide range of potentially game-changing uses. Over the last few years, one team of chemists and materials scientists has begun exploring military applications in harsh environments for aircraft, explosive devices and even combatants themselves. 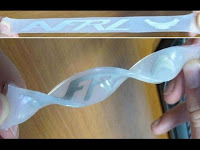 Stretchy, bendable electronics could have many uses, such as monitoring patients’ health and keeping tabs on airplanes.